Best Priced Meter of Its Kind! 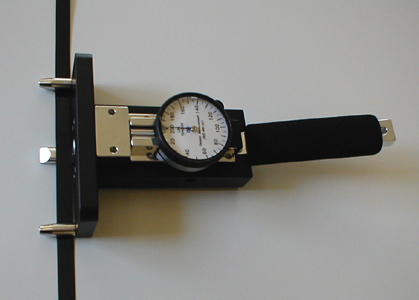 These Strap Tension Meters are used for measuring tension in Plastic/Poly strapping during packaging of pallets, boxes and cases. The center sensing foot has a chiseled end that allows it to slip under the strapping with little force. Meters are factory calibrated, lightweight, 11" in length and easy to use. The large dials make them easy to read. This meter allows your shipping department to take the extra step toward the reduction of shipping damage. The Model TMS-200 lb is the most commonly requested meter and is calibrated as a standard with .020"T x .500"W poly strap. When selecting a model we suggest that you avoid using the meter in the extreme high or low portion of the dial/range. For example, if you always measure tension in the 40 - 100 lb. range, you would use the model TMS-200 lb or TMS-100 kg.